The past two weeks have been crazy busy crafting up a storm, and between manipulating threads on my loom, using a fine steel crochet hook my nails bit the dust a week ago. The nasty turn our winter weather is taking had rendered my cuticles RAGGED. The hands are a total disaster. I spent yesterday giving them some TLC, and celebrated all my hard work with a pretty manicure last night. I used my 'hospital green' franken for the base colour. 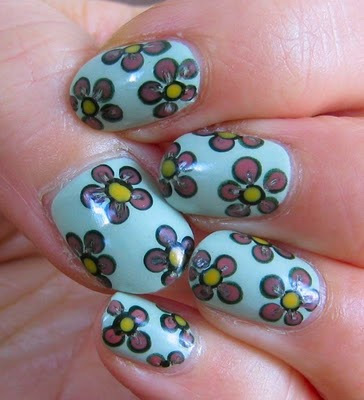 Then I made my flower petal dots using my larger dotting tool and NYC Flat Iron Green. I then placed a slightly smaller dot of Sinful Colors Vacation Time (the all-time favorite pink in my current collection) on top of each dark green dot, then went in with the toothpick and dragged the center of each dot towards the center. One more dot of Flat Iron green in the center of each flower, and finish off with a dot of Nina Ultra Pro Like Butta. I used Sally Hansen Insta-Dri Anti-Chip Top Coat to seal it all up. Thanks for looking! I hope I'll be back again full force over the next few weeks with a new manis! I've really missed doing them! Hope everybody has a nice day even if the weather is getting you down! That´s very cute! :D I love the idea of double dotting! I love the colors that you chose to make this design! They all just GO with each other. Very nice! it turned out great! at first i thought this was stickers or a decal. very retro. Danielle and Banana: Thank you both! I think I'll be doing a lot of double dots in the future! Enamel Girl: Oh wow! I am glad they look sharp enough to seem like decals. That's great news! Thx! And thank you Rins! :)I adore your Peanuts manicure! These are fabulous! I tried flowers once... and failed miserably. 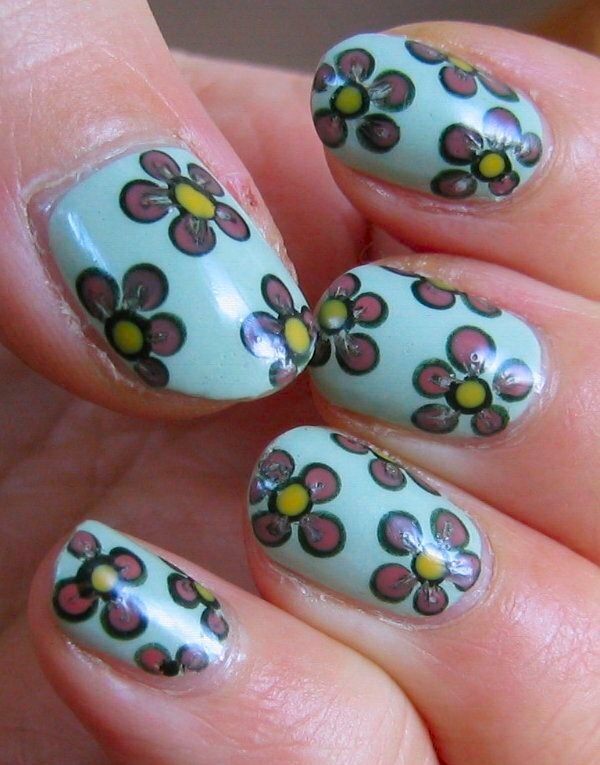 Love this mani. Ohmyword, these are great! I love them! Don't be surprised if I copy you at some point, they're just so cute!